Lou kisses Rosie in the vestry of her church, while a fire starts in the main church. Chloe Lambert gives Steph and Marc her blessing for the wedding. Lyn and Flick watch from the kitchen as Dee and Libby help Steph to put her veil on, properly this time! Lyn and Flick wander through with some nibbles and Dee starts to wonder when she's going to meet 'this gorgeous guy'. Lyn agrees that he is very good looking, which causes Libby and Dee to tease her a bit! Steph mentions that he should arrive within the next half hour as his plane would've landed. Lyn mentions she should take the veil off, but Steph would much rather keep wearing it, till the last minute. Libby starts to hint at the idea of a 'friend for Ben', but Steph tells her not to rush. Lyn announces that she'd like to be known as Nana Scully, though Flick isn't sure what she wants to be called and makes her excuse to pop over to the Hancock's to say goodbye. Lou tells Rosie that meeting her was the best thing that's happened to him in a long time. Rosie asks if he can smell burning and they look to the bottom of the door, where they can see the light from fire in the church. Harold and Mal return back from the Hancock's farewell. Mal tells Harold he spoke to his solicitor who told him that Harold has placed a bid for the ownership of the Coffee Shop. 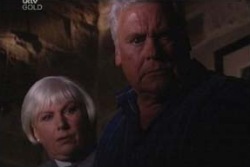 Harold confirms that he did, and Mal realises that he's underestimated him. Flick is walking down the pavement and turns the corner to see Rosie's church on fire. She gets out her phone and calls the fire brigade. Inside, as the room begins to fill with smoke, Lou and Rosie bang on the door to the church, yelling out for anyone who might hear them. Mal arrives to find Karl gluing together a model aeroplane with define precision. He mentions to Mal that he heard he'd bought the Hancock's house. Mal mentions that he came to tell him earlier, but he was out. He asks if Karl would be happy to be his agent for the house, but Karl is surprised to hear that he and Catherine aren't planning to move in. 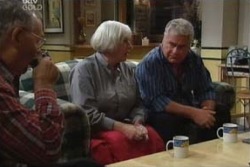 Mal tells him that Catherine is very settled in the UK and that he came over on a business trip. Karl thought that he'd come to visit the family and get to know young Ben, but instead he's staying at a hotel. Mal tells him that he does want to see them all and would love to stay with him, but doesn't understand why his business has to get in the way. Karl tells him that he should have a proper think about it. 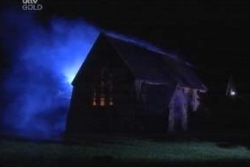 The church is now in full blaze, as Flick runs in to see if there's anyone in there. Surely that's not what you're supposed to do? Do they not teach fire safety anymore? Anyway, she manages to crawl to the vestry door and let Lou and Rosie out. They crawl back out the church between the blazing pews, to be met by paramedics at the door. 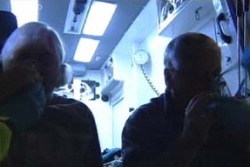 They are taken to the ambulance where Lou and Rosie are given oxygen masks. Marc arrives and Libby and Dee rush to meet him. Steph manages to prize him away and they go through to the kitchen. Dee, Libby and Lyn dig into the nibbles in the lounge, but on hearing the silence from the kitchen, Libby yells that it's rude to smooch when you've got guests. Steph and Marc agree to make an appearance, but not before Steph tells Marc something. She's pregnant. Mal comes over yet again to bug Harold about the Coffee Shop. He gives Harold an offer of $10,000 as a single, personal one of payment on top of the deal. Harold equates it to £3,000 back in the UK, and realises that it is worth nothing. Mal tells him he doesn't usually do this kind of deal, but Harold tells him that the Coffee Shop is his life and that it would take a lot more money than that to buy him out. Mal tells him to start the ball rolling, so Harold tells him at least ten times the amount. Mal isn't impressed and continues to argue his point, so Harold tells him to leave. Dee and Libby try to persuade Lyn to get some bubble blowers for the wedding. Marc tells Steph that it's great news and suggests they go and get some champagne, though he is not enthusiastic about it at all. Steph tells him that she hasn't told the others yet, so maybe they should wait a while, in case it's a false alarm. Karl arrives home as Mal is on the phone. It's his boss, who has taken him off the job as he hasn't secured the deal quick enough. Mal is not happy! 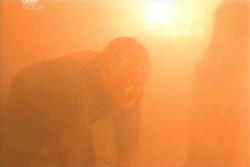 Harold comes over to let Lyn know that Flick, Lou and Rosie have been taken to the hospital and are being treated for smoke inhalation. Lyn thanks him for the news and heads down to the hospital with Dee whilst Harold goes to see if there's anything he can do at the church. Mal continues to argue why he should have been given another chance at his job. Karl tells him it'd be a good idea to ring back his boss and talk to him about it, but Mal recons they don't care. Lyn arrives back with Flick. They congratulate her on her rescue of Lou and Rosie, but she claims it was nothing. Libby comes through with her bridesmaid dress on and does a twirl, as Marc arrives back with some champagne. Lyn and Dee go through to the bedroom with Libby for a proper dress fitting. Steph tells Flick that she told Marc the news, and although he didn't seem that pleased at first, she thinks the idea is growing on him. Harold brings Lou and Rosie some nice warm mugs of tea. Rosie starts to cry as she realises that she realises that Flick really did save her. Lou mentions that he doesn't want to be that close to a fire ever again. Harold wonders how it started, and Lou lets slip that they were out the back, though Rosie covers it, telling Harold that Lou brought over some donations. Harold offers his support in trying to restore the church. Karl asks Mal if he's got any ideas on what he's going to do next. Mal recons that he may as well start up his old handyman business seeing as though he's been chucked off the job. Karl tells him he's done well for someone in his mid 20's who owns a family home and suggest him perhaps moving back into Ramsay Street. Mal however sees this as a setback and apologises to Karl for being a failure. MAL: Do you know what it's like to be told by your father that you're no good? KARL: Yeah, I do actually. MAL: Ah, well, maybe you're just a bit better at it, than your dad. Or maybe I'm just not as thick-skinned as you are. Karl is obviously hurt by the comment and walks to the bedroom. Steph wanders through to see Flick hang up the phone; she asks who she was talking to, but Flick replies 'no-one', which according to Steph is girls talk for a boyfriend. Flick tells her it was just a friend, but Steph says she's welcome to bring someone to the wedding if she'd like to. Steph wonders if she'd like to hang out with her today, as she wants to do the test, but Flick apologises saying that she's got to go and meet someone. Steph comes over to see Dee. She tells her that she thinks she's pregnant and has come over to take the test so that Dee can witness it for her! Karl is sitting having his breakfast when Mal comes through to grab a coffee. Karl asks what he's up to today, and Mal mentions that he's going to pack. Karl tells him he'll be too busy and goes to get dressed. Mal asks for him to stay and talk to him, but Karl continues to walk away. MAL: Dad, I love you. KARL: Well then, why don't you stay here? Why don't you move into the new house you've got here? Be part of us again. Mal tells him he wants too, but he's going to go back as he wouldn't know what he'd do if he gave up. He asks Karl for advice on what he would do. Realising that Catherine is happy in the UK, Karl isn't sure what he would do. Mal apologises for what he said the previous evening. Karl admits that he didn't realise how angry he was with Mal being away. He tells Mal he only got to see the first twenty years of his sons life and that he would like to see more. He admits to being jealous of what Mal has achieved so far and how when he was Mal's age, he was still a struggling interim. Mal admits that it's hard being away, and that he still loves him. They hug. Marc comes and meets Flick on the jetty of the lake. They agree that they need to talk about what's going on. Flick tells him that she loves him and that she thinks he loves her too.